Luleå, 26th July – One hundred and seventy international peace activists from 17 countries today entered the North European Aerospace Test range in a massive act of nonviolent civil disobedience in the north of Sweden. Some 28 activists have been confirmed as arrested or detained, among them activists from Venezuela, Spain, Germany, Germany, UK and Finland. A total of 201 people took part in the action, which aimed to expose the hidden role of the massive test range in the preparation for wars, including the testing of new military equipment such as drones, missiles and fighter planes. 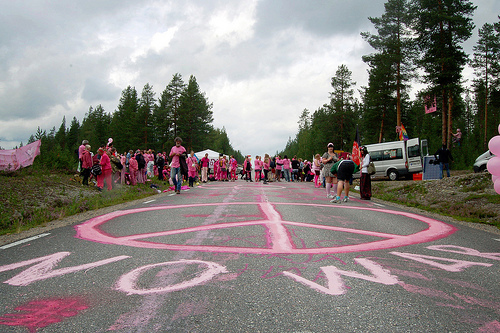 The action started at midday with a pink carnival which involved people marking the test range and the road leading to it with pink arrows and the slogan ”War starts here, let’s stop it here!”. The airspace was marked by a release of pink balloons. Over 150 of the activists then entered the ”prohibited area” around the base in an act of nonviolent civil disobedience, to draw attention to the war preparations taking place there and to place NEAT on the map. The North European Aerospace Test range (NEAT), in the north of Sweden, includes a bombing range the size of Belgium together with a larger restricted airspace. It is used for testing missiles, combat aircraft and unmanned aerial vehicles (drones). Last summer the US Air Force used it for live fire bombing practice, and in 2009 the NATO Response Force used the area for the nuclear alliance’s largest air exercise that year. Among the weapons tested at the range are the unmanned aerial vehicles (drones) such as those used in extra-judicial executions in Pakistan and elsewhere. The action is organised by the Swedish anti-militarist network Ofog and is supported by many Swedish and international groups. It is part of the international action camp, which is taking place in Luleå from 22nd to 29th July. Further actions of nonviolent civil disobedience are expected to take place over the remaining days of the camp. For more information, go to www.ofog.org.